There are better messages to get than the one telling you your security system is suddenly not so secure. Police no longer respond to burglar alarms unless there is visual, audible or eyewitness proof. When businesses and residences in Niagara, Toronto and London started getting this notice from their security providers last year, it set off alarms. That single sensor flashing when a window is smashed is no longer enough to warrant a police response in these cities. Police will send a car if several alarm sensors go off, suggesting movement through a business or residence, or if there is video or audio evidence, or if an eyewitness spots something. In Hamilton, police continue to respond to “all alarm calls, even if the alarm is only triggered in one zone,” but the policy is under review as it is now out of sync with neighbouring regions. “We are reviewing our current model and will be exploring the move to enhancing our verification system,” said Hamilton Police spokesperson Jackie Penman. Too many false alarms. That is the rationale for policy changes by police departments that report false alarm rates — as high as 97 per cent in Toronto. Hamilton Police responded to over 4,744 alarm calls in 2018, of which 95 per cent were determined to be false alarms, Penman said. The initial reaction to the police departments’ new policy was predictable: How could this be anything but a billboard to the bad guys? ADT Security Canada, the market leader in home security systems, was on the front lines of customer reaction, but it was ready with a guard-response service (at additional fees) to answer alarms that police ignored. The new requirement to validate a break-in through video got the phones ringing at firms such as Hamilton’s A.S. Security and Surveillance, which specializes in camera installation and applications that notify businesses of suspicious activities. The Hamilton company specializes in closed circuit television cameras that range in price from $500 to $2,000. “CCTV video is the best because it’s right there in your face — as a deterrent it’s the first level of protection,” Stayrer said. Reputation matters deeply to Stayrer, who says they are often put in a position of educating the public about cheaper-quality equipment being sold online. The 12-year-old Hamilton company with a staff of 14 was chosen for the city’s Fast 40 list of fastest growing companies and has gathered testimonials from clients as diverse as Tim Hortons, Canadian Warplane Heritage Museum, Samaj Hindu Temple and the Islamic Society of Niagara. Praise also comes from several private investigators who purchased covert spy cameras from A.S. Security. An office printer and Cuban cigars were outfitted with spy cameras for one fraud investigation that led to three criminal charges. If the user spots a break-in in progress, a 911 call is the next step because the video provides the “validation” that police need. Another Hamilton security company seeing rapid growth is Caliber Communications. The company launched in 2014 with two people and now employs 70 with annual sales nearing $5 million, according to co-founder Joe Perfetto. The performance earned them a spot on city’s Fast 40 list and the Startup 50 list of the country’s newest and fastest growing companies. Caliber’s market is Ontario-wide. It plans to expand to other provinces with a client list that includes construction companies, utility companies, cannabis greenhouse operations and the Veld Music Festival at Toronto’s Downsview. Caliber’s edge is a portfolio of 14 patents, including one for a video compression technique that utilizes the cell tower network to reach users’ phones for notifications of break-ins. 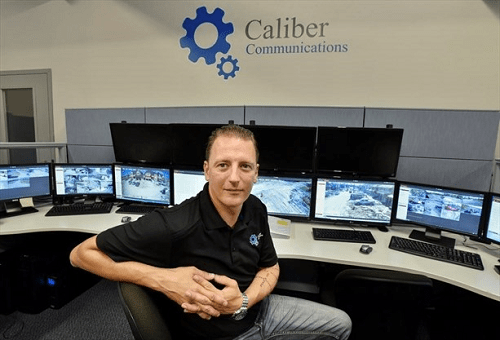 Caliber considers itself a security and communications company for software in a computing “neural net” that is trained to identify specific objects from a video feed, as well as a hardware manufacturer — it designs and builds its camera units on an assembly floor at its Stoney Creek location. Services include in-house monitoring of video feeds. During evening and weekend shifts watching screens, Caliber operators are assisted by the system’s central image processing unit which flags objects it “recognizes,” explains resident software engineer and co-founder Alex Vourkoutiotis. For the purposes of identifying spools of copper wire for a large utility company, Vourkoutiotis said the company uploaded 6,800 different images of wire spools in various lighting conditions and angles, then “trained” the system to identify these objects in a video feed. So far, about 4,000 images can be identified within Caliber’s system, and Vourkoutiotis says the meaning of relationships between objects is growing. “If someone has a backpack, there is a greater chance that they could steal more than someone without a backpack,” he says, adding that their system is gaining the ability to make these determinations to assist the operators watching. The operators are, in essence, remote guards assisted by technology, but the cost is about a quarter of what it would cost to hire someone to patrol the actual location, Vourkoutiotis says. “Security in the future is going to come down to a single feature — the ability to identify an object,” Vourkoutiotis said. The growing sophistication of electronic security systems will put a dent in the on-site guard business, according to an industry report by IBISWorld. The Canadian security-guard market’s revenue is expected to grow at 0.4 per cent a year and hit $5.9 billion by 2023, compared with 2.3 per cent growth in the security alarm market, on a revenue target of $2.6 billion by 2023. But the biggest threat to growth in the whole security market is the declining crime rate, IBISWorld reports. In the residential security market, about 20 per cent of Canadian homes have a security system. Because of that relatively low market penetration, there’s room for growth, says ADT communications manager Monique Bois. Bois acknowledges that falling crime rates are a factor in sales, but she notes that the company provides more than break-in protection, with smoke detectors and heat sensors that trigger fire department response. In the past five years, IBISWorld estimates that the number of security alarm services companies has grown by 2.4 per cent, to 3,640, in Canada, and profit margins averaged 8.5 per cent between 2013 and 2016, with a high of 9.1 per cent in 2015. A few large corporate deals provide greater illumination of the industry. In 2014, Boca Raton, Fla.-based ADT bought Montreal-based Reliance Protectron Inc. for $560 million and, two years later, ADT itself was swallowed up by Apollo Global Management for almost $7 billion. Last fall, ADT bought Red Hawk Fire and Security for $317 million.